Does your heart beat faster when you hear the word sushi? Whether it’s for lunch, dinner or just as a snack: sushi is always a good idea and people all over the world enjoy it in a wide variety of ways. However, finding great sushi restaurants can be a difficult task. 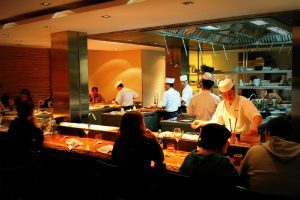 Although Spanish and Catalan cuisine dominates the restaurant scene in Barcelona, the city is also buzzing with international eateries and home to several great sushi restaurants. These are the best examples we can find! Ikibana perhaps isn’t your typical sushi joint but believe us, it’s worth a visit. From its 3 locations in Barcelona (Paral•lel, Sarrià and El Born) it offers an exotic fusion of Japanese and Brazilian cuisine, giving a truly unique experience to sample the mix of East and West at the same time. Some of their specialities include tempura vegetables with prawns, squid and sauce, Prawn tempura maki with avocado and mayonnaise, covered with fish roe, and noodles with vegetables and meat with Japanese sauce. The restaurant features a sake bar where you can taste the potent (!) Japanese alcoholic drink made from rice or try the extensive wine and cocktail list. 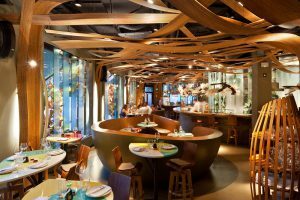 In addition, the Ikibana restaurants have a very cool and modern yet at the same time welcoming design, featuring amazing woodwork that decorates the ceiling and forms circular benches. If you want to enjoy a completely new culinary experience and, at the same time, a very pleasant stay in a welcoming ambiance then this is the perfect place for you! With a name that translates as ‘intense seasonal flavour’, this restaurant is already half way there to grabbing any foodie’s attention, and once you’ve glimpsed the menu, you’ll be there in a flash. Koy Shunka‘s menu is extensive, so if you want to try a bit of everything we advise ordering the tasting menu (wallet permitting! ), consisting of eleven dishes and desserts. Japanese noodles ‘somen’, caviar, grilled oysters, raw fish niguiris and wagyu veal tataki with wasabi sauce, are just some of the delicacies featured on this menu. The restaurant is located in the heart of Barcelona just off Via Laietana, in an exceptional environment with a carefully considered interior design that focuses on the huge central kitchen, surrounded by a wide sushi bar made from cedar wood. It is necessary to book in advance. Try to sit at the bar because it’s the best way to enjoy the culinary show on the frontline and only there can you taste sushi pieces off the menu at the recommendation of the chef. Above all, this restaurant pulls out all the stops for presentation, you’ll find it very difficult not to whip out your camera as soon as your plate lands in front of you…particularly when dessert comes! 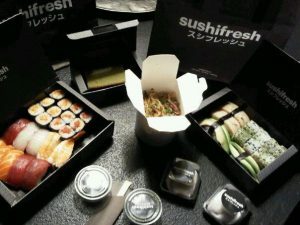 At Sushifresh they serve home delivery or takeaway sushi made with fresh ingredients. This is the perfect spot for a fun night out with friends or for an evening in on the sofa. Sushifresh is situated in Gràcia and offers a friendly atmosphere, featuring stylish and clean-cut décor. The food is more simple than Ikibana and Koy Shunka however it’s still a good shout for a more casual and affordable meal. 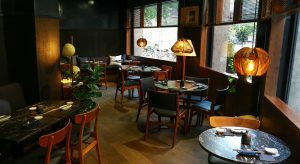 Located on the leafy Carrer d’Enrique Granados, let Robata welcome you into its cool vibes with its low lighting and contemporary furniture, complemented with a few plants here and there, making you feel as though you’ve stepped into Japan! This Japanese grill-style restaurant serves up dishes of meat, fish, vegetables and sushi rolls cooked following the traditional technique to conserve and respect the ingredients’ authentic flavours. Expect triangles of sushi rice finished off on the grill to give them a crispy covering, lightly fried tempura sushi rolls and griddled asparagus or corn on the cob. Robata also serves a few special homemade desserts served as double portions so you can share with a friend or special someone! This is an excellent mid-range choice for a chic, cool and ultimately delicious night out in Barcelona! Kibuka is located in the trendy neighbourhood of Gràcia on Carrer de Goya, just off Plaça de la Vila de Gràcia where locals gather for evening drinks before dinner. The interior of the restaurant retains many traditional Catalan elements such as the arched ceiling, wooden ceiling fans, beams, stained glass windows and a long bar perfect for sitting and enjoying a sake! Simplistic wooden tables and chairs and Japanese motifs on the wall complement the laidback style. The overall effect is a welcoming one – perfect for a relaxed evening with friends or a special someone to enjoy the freshly made sushi. The menu is very varied and the chefs are very creative with unusual ingredients. Dishes include salmon and avocado with Japanese tartar sauce and mint, tuna tartar with fresh basil and kiwi and white fish with langostine, lime and coriander. As well as sushi, Kibuka also serves hot dishes such as tempura vegetables, lightly fried tempura sushi rolls, and noodle dishes to warm you up in the cooler months. For a real dive into Japanese cuisine, we highly recommend the green tea mochi for dessert! We suggest you order with sharing in mind….mainly to avoid food envy! 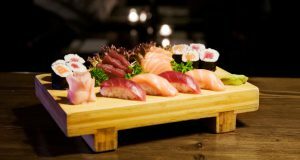 With a second location (Kibuka Sushi Bar & Drinks) on Carrer Verdi just a few minutes’ walk away, you can continue the Japanese-inspired fun all night long.